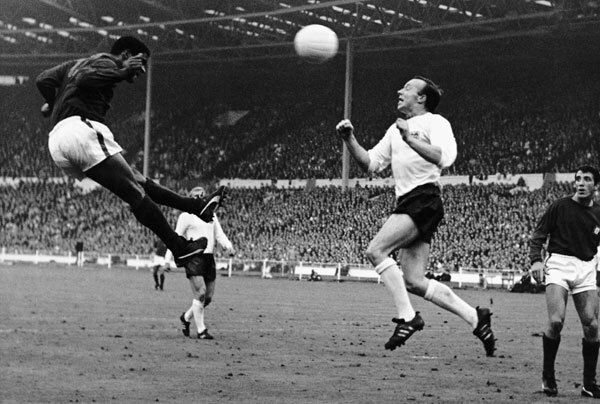 Eusebio leaps for a header during Portugal’s World Cup semi-final match against England at Wembley. The Portuguese government has declared three days of national mourning in honour of Eusebio, the legendary Portugal and Benfica top scorer, who has died, aged 71. Fans paid homage by visiting an iconic statue of him erected next to the Benfica stadium, leaving flowers and scarves while tributes poured in from around the world. One minute’s applause in tribute was held at Old Trafford before the third round English FA Cup-tie between Manchester United and Swansea City. Eusebio da Silva Ferreira was born in Lourenco Marques (now Maputo), Mozambique, on January 25, 1942. He died on Sunday morning after a cardiac arrest. He had been suffering heart problems for some years. He scored 733 goals in 745 competitive games over his career, won the European Cup with Benfica in 1962 and was named European Footballer of the Year in 1965. Ronaldo, Portugal’s current superstar, wrote on his website: “Always eternal, Eusebio, rest in peace.” The message was accompanied by a picture of the two together. The Real Madrid forward appears certain to establish himself as Portugal’s new record marksman at the World Cup in Brazil. Though he played for Portugal Eusebio was the first great African footballer to make a mark on the world game. The former Benfica legend was born and brought up in Mozambique when it was a Portuguese colony and its promising footballers were swept away to Lisbon and Oporto and spearheaded not only Portugal’s great clubs but its national team. Most notably Eusebio was nine-goal leading scorer when Portugal finished a best-ever third at the 1966 World Cup in England. At club level he won the European Champions Cup in 1962, was a losing finalist three times, won 11 Portuguese league titles and five domestic cups. He scored a then record 41 goals in 64 internationals, was seven times league top scorer and European Golden Shoe winner in 1968 and 1973. The young Eusebio, ironically, was a nursery product not of Benfica but of their great Lisbon rivals, Sporting. But he was brought to Portugal by Benfica and promoted by the club’s veteran Hungarian coach Bela Guttmann. The nucleus of the Benfica team which Guttmann had guided to European Cup victory in 1961 had come from Africa but Eusebio would prove the greatest of them all. Guttmann introduced Eusebio to the first team at the end of the 1960-61 season. He was a reserve when Benfica went to France to face Santos of Brazil – inspired by Pele – in the famous Paris Tournament. At half-time Benica were losing 3-0. Guttmann, with nothing to lose, sent on Eusebio. Benfica still lost but Eusebio scored a spectacular hat-trick and outshone even Pele. He was still only 19. A year later Eusebio scored two cannonball goals in the 5-3 victory Benfica ran up against the Real Madrid of Alfredo Di Stefano and Ferenc Puskas in the European Cup Final in Amsterdam. This was a springboard from which Eusebio went on to become European Footballer of the Year in 1965 and explode on his one and only World Cup appearance in England in 1966, most notably with four goals in the astonishing quarter-final comeback against North Korea. Goal No9 was Portugal’s penalty winner against the Soviet Union and the great Lev Yashin in the third place play-off. 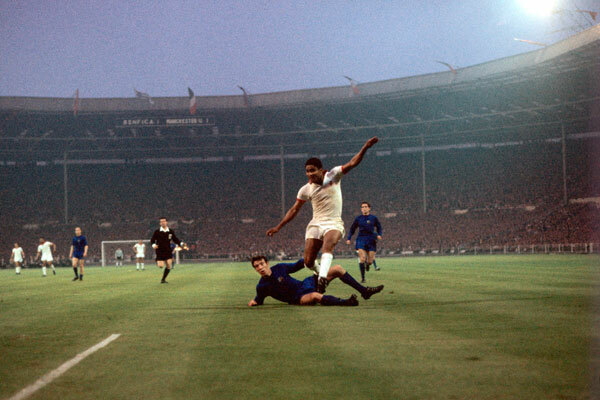 Eusebio in action during the 1968 European Cup final against Manchester United. Football was always Eusebio’s life and when the North American Soccer League offered him the chance of a lucrative extension to his career he flew west to play for the Boston Minutemen, the Toronto Metros-Croatia and finally Las Vegas Quicksilver. Later he played again briefly in Portugal before taking up appointments as television analyst and as the honoured public face of Benfica and the Portuguese federation. Fans around the world took Eusebio to their hearts not only because of his ability but because of the sportsmanslike way in which he played the people’s game. At Wembley in 1968 Eusebio could have won the European Cup Final for Benfica against Manchester United in the closing minutes of normal time but was foiled by the intuition of goalkeeper Alex Stepney. In response Eusebio patted Stepney on the back, applauding a worthy opponent. A statue of Eusebio in action now dominates the entrance to the Estadio do Benfica: no eagle of Lisbon ever flew higher in world football.